Bistro Lighting in Sunset Hills, Greensboro, NC 27403. PROJECT SUMMARY: A new trend in the landscape lighting industry is taking off. More and more clients are choosing to incorporate these lights into their backyard, patios, decks, pergolas, and outdoor kitchens. If you’ve never heard of bistro lights before, you may have heard them by another name. This client in the Sunset Hills Neighborhood of Greensboro, NC was adamant about wanting Bistro Lights strung over his new landscape and patio after he had just recently been to an upscale restaurant on their outdoor patio and fell in love with these string lights. LANDSCAPE LIGHTING FOCUS: The patio was definitely the main focus for this outdoor lighting system. Re-creating the beautiful dining experience this couple had just experienced at a local upscale restaurant was important. SERENITY lighting is always needed to give the space and property a clean and natural lighting design during evening hours. LOCATION: The lighting designs and installation for this project can be found in Sunset Hills, Greensboro, NC 27403. Adequate lighting with a lot of flexibility was Southern Lights main objective. There would be times where the lighting needs would require 100% intensity, and others where only a low level light was desired. For this reason, we installed an in-line dimmer switch that can allow the bistro lights to range in brightness levels. This project was designed to run on a 12v transformer instead of 120v. This meant that our clients could add on additional landscape lighting down the road into the existing infrastructure. Each strand of string lights needed to be custom cut to fit the space. 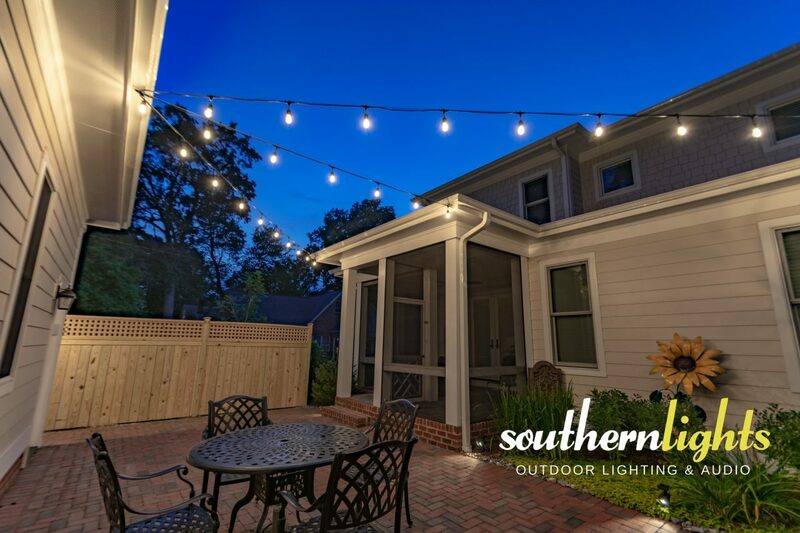 Southern Lights uses high-quality, commercial grade string lights unlike what homeowners can find in the big box stores or online. We custom cut our lines to the perfect length from long rolls to ensure we can create a clean design and install.